This recipe is a slight variation on the classic Neapolitan dish spaghetti all'aglio, olio e peperoncino. I first had aglio e olio on a trip to (you guessed it) Naples, Italy. My wife and I were visiting our friend Mike, who was stationed at the U.S. Naval base in Naples. The first night we were there, we all went to dinner at a mellow family restaurant. It was called Angela's, or something similar. Still a bit tired and jet lagged, I wanted something comforting. Mike recommended spaghetti all'aglio, olio e peperoncino, a basic dish made with pasta, olive oil, dried red chili flakes, garlic, and Italian parsley. Heeding his advice, that's what I ordered. When the food arrived I took a few forkfuls and was instantly in a state of bliss. How could something so incredibly simple taste so incredibly good? By the time I finished my meal (and a few bottles of wine), I had a new favorite Italian dish. On returning to the U.S., I started experimenting with different recipes and making my own aglio e olio. What follows is more or less my go-to method of preparing the dish. I say "more or less" because I don't put much thought into it when I make aglio e olio. I just sort of do it. 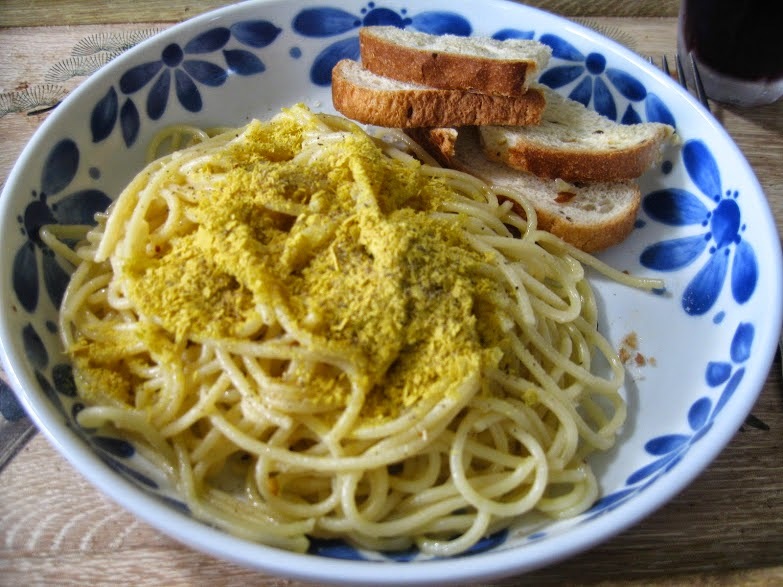 A major change I make involves switching out Italian parsley for nutritional yeast. To be honest, most of the times I make aglio e olio it is a spur of the moment thing and I usually don't have Italian parsley on hand. Plus, nutritional yeast gives the pasta a nice nutty, cheesy flavor. The extra B vitamins are a good thing, too. 1. Cook the pasta until al dente ("to the tooth"). Right before you drain the pasta scoop out half a cup of the cooking water and put it to the side. 2. In the same pot you used to cook the pasta, add the olive oil and reduce the heat to medium. Add the garlic and stir frequently for about two minutes. Add the pepper flakes and continue to stir. 3. Just as the garlic begins to get soft but before it becomes too brown, toss in the pasta. Stir it around, and then add the reserved pasta water. The pasta water contains starches that will help the ingredients stick to the pasta. Continue stirring for another two or three minutes. Don't overcook! I make this at least once a month. I recommend enjoying a cocktail such as a Martini or Negroni while cooking, and listening to this cool track by Nicola Conte.